Grupo de Investigación en Ciencias Forenses y Salud, Tecnológico de AntioquiaInstitución Universitaria, Medellín, Colombia, Calle 78B N 72A220 of 5124. *lgomez@tdea.edu.co. An updated checklist of necrophagous flies (Diptera, Calyptratae) occurring in the urban area of MedellínColombia is presented. 27 species belonging to 4 families are reported. Data were obtained from field work and recent bibliography references. Key words: forensic entomology, carrion, Calliphoridae, Sarcophagidae, inventory. Se presenta una lista actualizada de moscas necrófagas (Diptera, Calyptratae) presentes en el área urbana del municipio de Medellín. Se registran 27 especies incluidas en cuatro familias. Los datos se obtuvieron a partir de recolectas en campo y referencias bibliográficas. Palabras clave: entomología forense, carroña, Calliphoridae, Sarcophagidae, inventario. Diptera is one of the mega diverse order of insects and encompasses approximately 152 000 described species (Courtney et al., 2009). In the neotropical region, near to 24 000 species had been reported (Amorim et al., 2002). This order of insects is one of the most diverse ones concerning to morphology and habits. This group includes pollinators, predators, parasitoids, decomposers of plant and animal organic matter playing an important ecological role in the recycling of elements in the ecosystems (Hanski, 1987), and some others that could transmit diseases behaving as mechanical vectors (Skevington and Dang, 2002; Brown et al., 2009). Calyptratae flies (Diptera, Brachycera) are comprised of approximately 18 000 species worldwide and includes blowflies (Calliphoridae), fleshflies (Sarcophagidae) and house flies (Muscidae) among others. These families are of significant importance from the forensic point of view due to their decomposer and synanthropic habits. Unfortunately, no official data on species richness for calyptratae species are available for Colombia. In the last 2 decades, carrion feeding arthropods mainly calyptratae flies had been used in forensic entomology to establish circumstances of death in legal cases (Smith, 1986; Cats and Haskell, 1990; Greenberg, 1991). Studies of forensic entomology emphasize the importance of the families Calliphoridae, Muscidae, Sarcophagidae and Fanniidae among others due to their ecological traits, including its predominance in colonizing corpses (Catt and Goff, 1992). In Colombia, studies on decomposer or necrophagous flies had been focused on forensic entomology development, but unfortunately no local comprehensive inventories of this fauna had been done. In Medellín, the most important studies have been those by Restrepo et al. (2000), Wolff et al. (2001) and Pérez et al. (2005) on pig corpses; but in some cases, taxonomic identification at species level have not been achieved. In order to offer a faunistic tool to forensic entomology development and further ecology studies, an updated check list of necrophagous flies recorded in the city of Medellín, Colombia based on field work and bibliography references is presented. Flies were collected from October to December in 4 sites: a restaurant area (AR) 6°12'31.8" N, 75°34'04.4" W, a residential complex (RC) 6°15'27.6" N, 75°34'44.2" W, a marketplace (MP) 6°15'26.2" N, 75°34'29" W, and a slaughterhouse (SH) 6°18'06.4" N, 075°33'45.7" W. At each site, 2 McPhail modified traps were baited with rotten fish heads and chicken viscera (further details in Amat, 2010). The traps were operated 1 day from 10:00 to 14:00 hrs. Specimens collected were identified using the taxonomic keys of Chillcott (1961), Amat et al. (2008), Buck et al. (2009), Buenaventura et al. (2009), and Grisales (2010). Some Muscidae and Sarcophagidae specimens were identified by Dra. Couri and MelloPatiu at Museu Nacional in Rio de Janeiro, Brazil. Specimens were mounted and deposited in the entomological collection of Tecnológico de Antioquia, Medellín, Colombia (CETDEA). Twelve species were collected in this study, 11 of these are reported for the first time from Medellín. 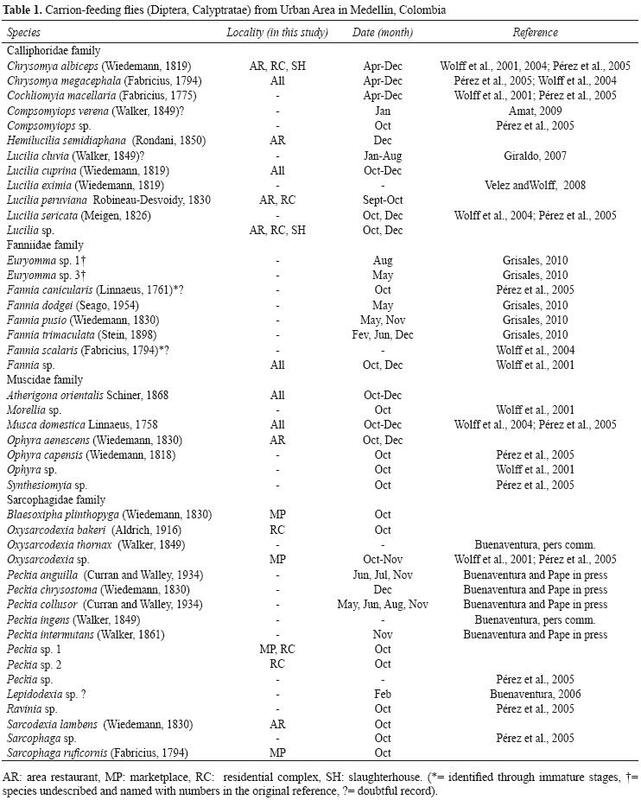 A total number of 29 species were summarized and listed, morphotypes identified at genus level are included (Table 1), Calliphoridae and Sarcophagidae being the richest families. Calliphoridae mainly represented by: 1), Chrysomya albiceps (Wiedemann, 1819), previously reported by Wolff et al. (2001) in Antioquia and currently reported in all natural regions of Colombia from 0 to 2 700 m asl by Amat (2009). 2), the introduced synanthropic latrine fly Chrysomya megacephala (Fabricius, 1794), previously reported in Colombia, in the provinces of Antioquia, Boyacá, Sucre, Vaupés, Bolívar, and Chocó (Pape et al., 2008). 3), the green bottlefly, Lucilia cuprina (Wiedemann, 1830), reported in the province of Antioquia by Pape et al. (2004). 4), Lucilia peruviana RobineauDesvoidy, 1830 reported in Andean region mainly in Antioquia, Caldas and Risaralda provinces (Florez and Wolff, 2009), and 5), Hemilucilia semidiaphana (Rondani, 1850), reported in this study, for the first time in Medellín. The family Muscidae was represented by: 1), Atherigona orientalis Schiner, 1868, genus previously reported in the Province of Antioquia by Pérez (2007). 2), Musca domestica Linnaeus, 1758, a widely distributed specie, and 3), Ophyra aenescens (Wiedemann, 1830), reported in this study for the first time in the urban area of Medellín, although the genus was reported previously in the Province of Antioquia by Pérez (2007). The family Sarcophagidae (Fleshflies) was mainly represented by the genera Oxysarcodexia and Peckia, both taxa widely distributed in Colombia, were previously reported by Pape et al. (2004) and Buenaventura et al. (2007). Neotropical Peckia species, found here, were recently reviewed and keyed by Buenaventura and Pape (in press). Blaesoxipha plinthopyga is previously reported from Antioquia (Pape et al., 2004). Sarcodexia lambens previously reported in Chocó, Magdalena and Putumayo provinces, and finally Sarcophaga ruficornis reported in an insular area from Colombia by Buenaventura et al. (2007). And finally, Fannidae, with specimens that could not be identified at the species level, due to the fact that no males were collected in order to review diagnostic characters. Fannia and Euryomma species reported here have been reviewed and keyed by Grisales (2010). The entomofauna in the tropics is characterized to be rich in species and still underestimated (Gaston, 1991). Necrophagous flies communities found in Neotropical environments probably are not the exception in terms of species richness if compared with other studies in the holartic region whose assemblages comprise only a few number of species, usually dominated by 1 to 3 species (Hanski, 1987). The composition of species presented in this study may serve as baseline for future ecological research in a multidimensional scale, and will provide support to consolidate the framework in the use of techniques of forensic entomology development. We believe that conducting longterm studies at Medellín can provide a better understanding of these fly communities and the species richness will be most likely increased. We thank the Muscidae and Sarcophagidae specialist named in the text for taxonomic identifications. We also thank to the Director's Office of Research and Postgraduate courses (CITIA) and the Committee of Research (CODEI) of Tecnológico de Antioquia; for the financial support. To Eliana Buenaventura for sharing Sarcophagidae unpublished data.